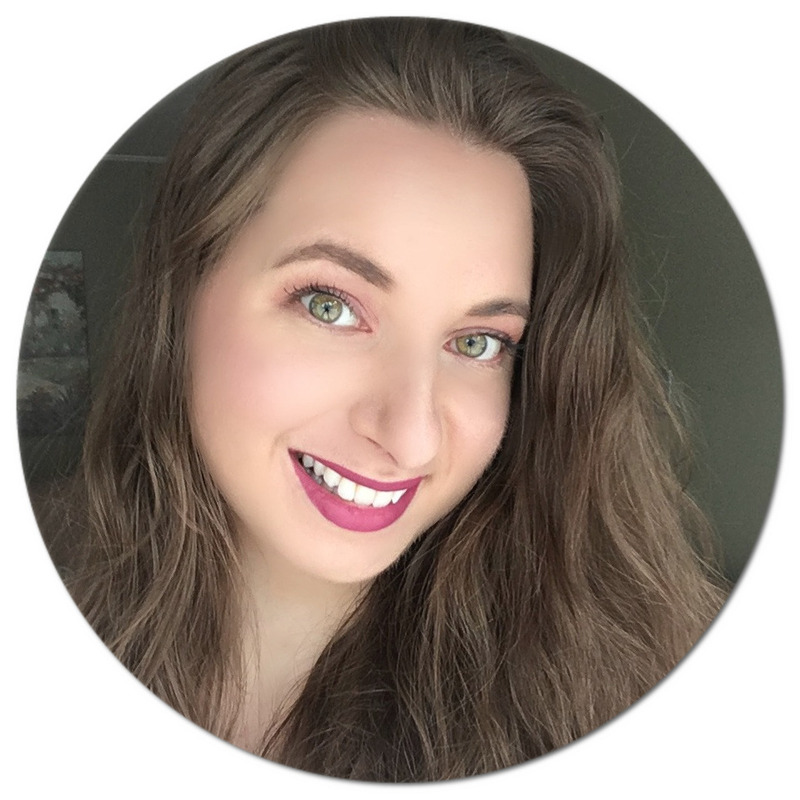 Since gravitating toward more natural beauty brands a couple of years ago, there have been quite a few that have topped my list of must tries, one of them being 100% Pure. In case you have never heard of them, 100% Pure is an organic beauty company based in California that specializes in fruit-pigmented and antioxidant rich cosmetics, including makeup, skincare, hair care and even nail polish. Their products are super clean and safe, meaning many of them even smell like you could eat them (but please don't)! I have previously tried a few of their products, namely their Fruit Pigmented Healthy Skin Foundation Powder (review + demo), their Everywhere Sun Stick SPF 30 (featured) and their Nail Polish in Coachella (worn here), so I was really looking forward to discover even more of their products. Well, the day has come and I have a handful of new-to-me goodies that I'm super excited to share with you (spoiler alert: they don't disappoint)! 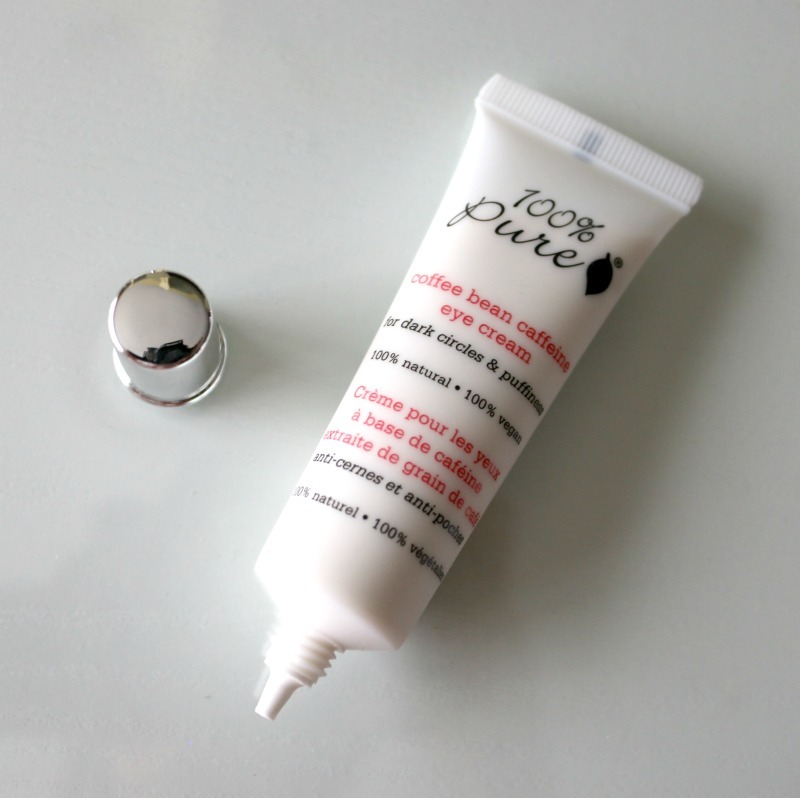 After applying the 100% Pure Coffee Bean Caffeine Eye Cream* for the first time, I knew I had found a new fave. This vegan eye cream smells like dessert to me, and even though I don't drink coffee, I know how beneficial caffeine is when applied topically. If you suffer from puffy under-eyes, dark circles or even fine lines and wrinkles, this eye cream is said to tackle them all. Green tea and green coffee work to increase blood circulation in the under-eye area and brighten the skin, while other ingredients such as organic aloe vera, rose water, rosehip oil, vitamin E, rosemary, oregano, thyme and vanilla moisturize, firm and replenish the skin with vitamins, minerals and antioxidants. The cream is suitable for all skin types, is super light and holds well under makeup to top it all off! 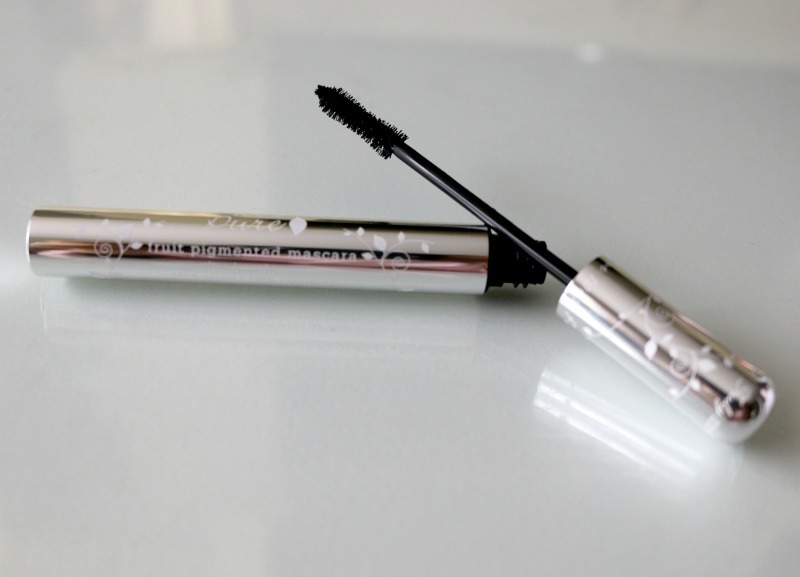 Have you ever tried a mascara that actually smells good? The 100% Pure Fruit Pigmented Ultra Lengthening Mascara in Black Tea* is vegetarian and smells like strawberry yogurt in my opinion. But wait until you read what it's made with: black tea, chocolate, berry pigments, provitamin B5, vitamin E, oat and wheat protein, just to name a few! Not only that, but it is actually water resistant and doesn't flake. It layers nicely without clumping and separates my lashes with ease. It isn't the most volumizing, but is definitely lengthening. The brush dips slightly at the center which helps lift the lashes, although I still prefer to curl mine beforehand for optimal results. 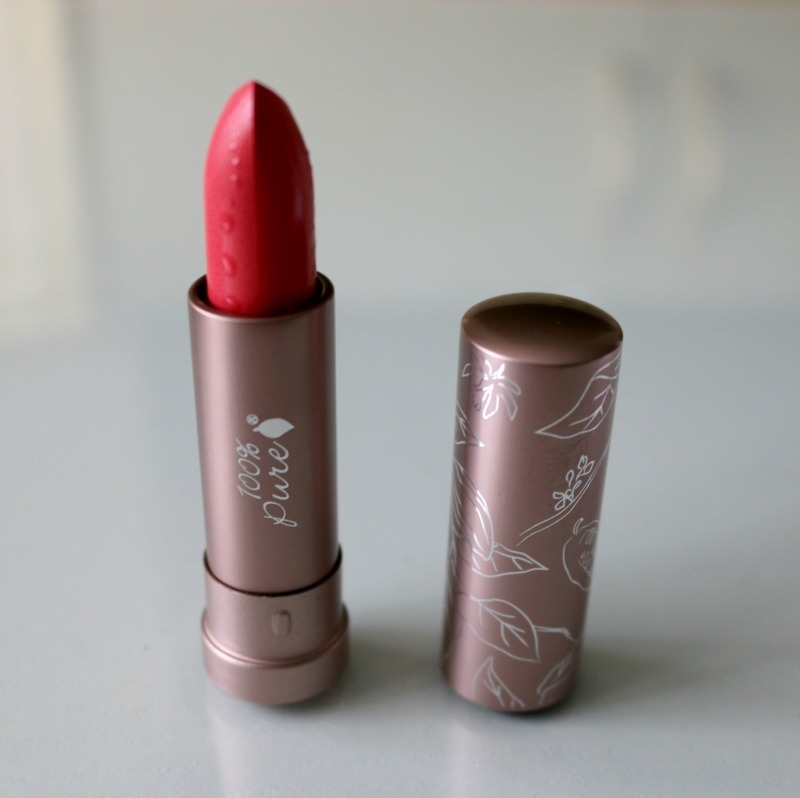 And now for one of the prettiest coral pink lipsticks I think I've tried to date: the 100% Pure Cocoa Butter Semi-Matte Lipstick in Prickly Pear*. Go figure I chose this shade because I love prickly pears! This vegan lipstick melts on contact with your lips and immediately feels moisturizing and super rich. As you can see, my bullet seems to be sweating which I think might be due to it arriving on a frigidly cold winter's day, and since it doesn't contain artificial preservatives, it took a few days for these drops to evaporate. 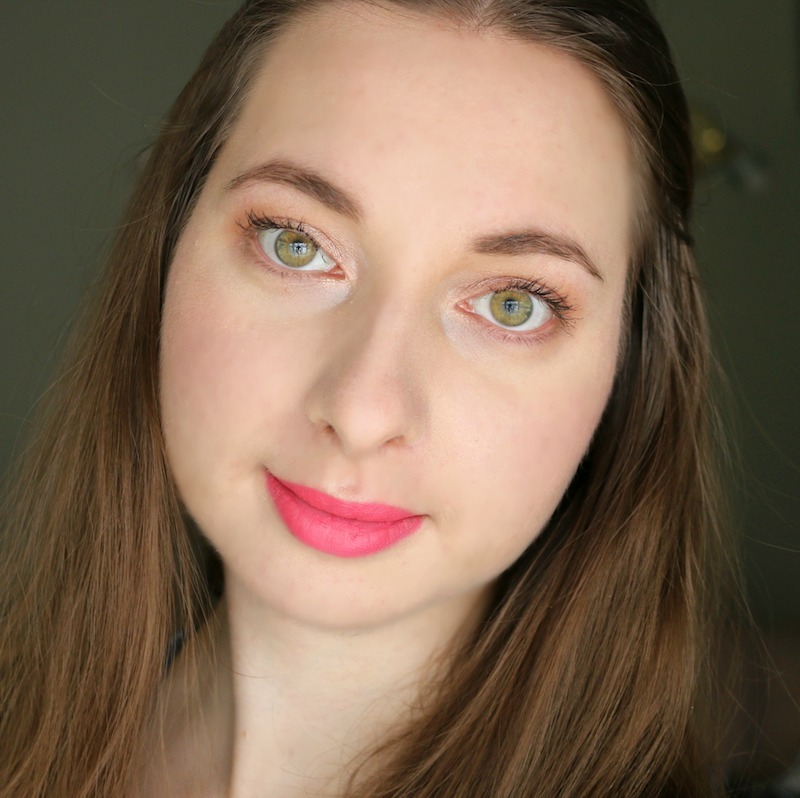 See both the mascara and lipstick in action below! I applied the eye cream underneath my concealer, and as you can see my under eyes look nice and smooth. Have you heard of 100% Pure? Anything you want to try? Thanks for sharing this company. I have never heard of them. There products sound fantastic. I am continually trying to live cleaner. Oddly enough I have only tried their cream nail polishes but I really like them! I have a sample of the eye cream laying around, I should try it out because I do suffer from puffiness and bags! Beautiful make up, so girly and very classy! I've not heard of any of those companies but they do sound like something worth buying! It's not for me but it looks really good on you. When my GG wears makeup she prefers a natural look and not bright colors like the lip stick here, but that's for everyday wear... going out she likes a more exotic look. These products look great on you. 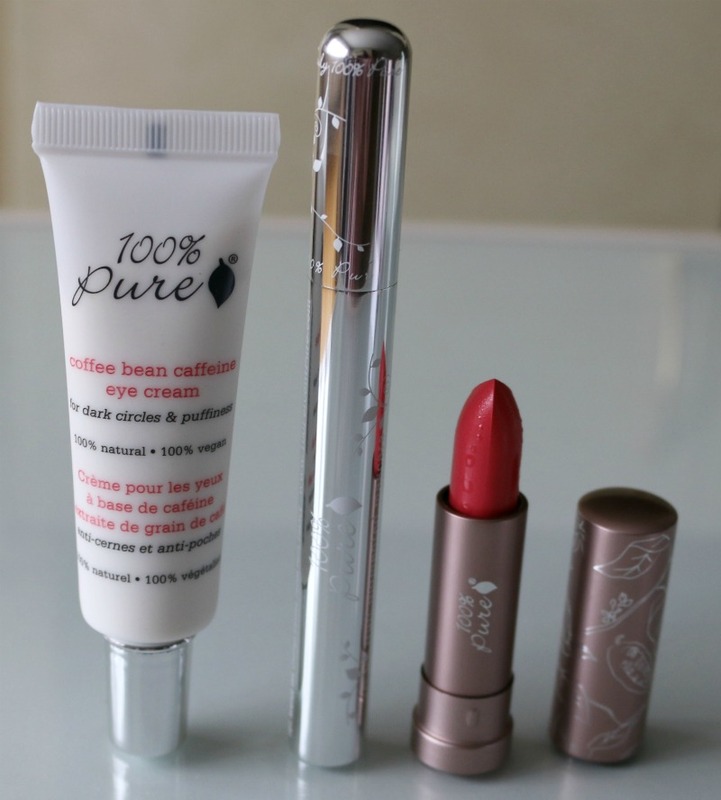 I'd really like to try them all, especially the the 100% Pure Coffee Bean Caffeine Eye Cream. This is a brand I definitely want to try! There's a spa close to here that carries them so I can go swatch their products, and buy them there too (no need to wait for shipping). That lipstick shade looks gorgeous on you! And it's a perfect shade for the spring and summer. This line looks so glamorous -- I have to try it! I'm obsessed with the lipstick color. It's gorgeous on you. OH my I need to look into that coffee bean eye cream I need that badly as I have puffy and under eye dark circles. Thank you! It's always nice to discover products like this. It's really perfect for sensitive skin. Thank you for introducing me to this brand as well as sharing your experience with them. That color is absolutely incredible and really works well with your skin tone. I'm still trying to find a mascara that will evenly work on both of my eyes without causing one to look "stuck" compared to the other, this may be just the ticket! I've heard alot about this, i actually have the same mascara, it smells nice and works perfect for me! This sounds like a super brand, and I love the idea of caffeine for under my eyes, lol! I'll have to pick up some of that! I won't use makeup unless it is clean. My favorite 100% Pure product is the eyebrow filler. It makes my eyebrows look so good. I also use the mascara, even though I think the clean stuff never works as well as the chemical filled options. But I use the clean stuff anyway. The mascara looks soo pretty! I love beautiful packaging! I hate my dark circles..i want to get rid of them. It is a unisex product and 100% vegetarian; perfect for me. I've never heard of this brand but it sounds great - vegan and vegetarian products with natural ingredients that smell like dessert? what not to love! I am not familiar with this line, but the packaging is really pretty! I have heard about using coffee extracts and beans as a beauty remedy. I wouldn't mind seeing what the eye cream can do. I've never heard of this brand before, but I haven't explored the makeup section at any stores lately. How waterproof is the mascara? I've tried some and found that if you are exercising and start sweating, the mascara smears if you wipe your face. It isn't waterproof, only water resistant. I do not wear makeup when exercising so I am not sure how sweat/smudge proof it is, sorry! I don't wear makeup, but would be interested to try that eye cream. It sounds really awesome. I have been looking for the perfect eye cream and I think I've finally found it. Most eye creams I've tried feel weird and burns. I love that this eye cream has caffeine and so many more ingredients that are so good for my skin. I have the same mascara at home, it works fine! i like it! These all look great, but I'm really interested in the coffee eye cream. Coffee infused products are really amazing for the skin. I can honestly say I have never really smelled my mascara. Now I am intrigued to how it does smell. While I do not wear this I know my wife and daughters would appreciate the look of these. Thanks for sharing these! I have used a caffeine eye cream in the past and it worked wonders. This coffee bean caffeine eye cream sounds awesome for tired eyes. I've tried their product before and I love that they use natural and vegan ingredients. Like the mascara smells likes fruits lol They use fruit pigmentation to get the colors for their blush set. Love it! I really love the lip color. I personally love organic & natural brands and have been finding new ones to try, so will surely try this out. I need to try that coffee bean eye cream! I have had dark circle under my eyes for years. I love that they are vegan and natural products. Love hearing about different skincare regimens. I am not much on lipstick. Always ends up on my teeth lol. Thanks for sharing! Oh coffee bean eye cream? Does it have a smell like that delicious coffee smell? I would buy it just because of the red fixing. Topical caffeine absorption was something I did not believe in until I got to read about the stuff. It does work and the health benefits are the same as ingesting the delicious liquid. I would love to try that eye cream. Looks likes something I could use right now. This eye cream is just what I am looking for. I am always searching for product that will help me minimize the puffiness around my eyes and my under-eye dark circles. This is right on time. My mascara has been burning my eyes lately and I had to toss it. I'm in desperate need of a cleaner/healthier formula. First of all, you're gorgeous! And coffee eye cream sounds like it's straight from heaven! I love that color of lipstick on you, beautiful! The coffee eye cream looks beautiful too. I love the shade of your lipstick. It compliments the color of your skin. I am starting to get more into natural products and home remedies. This looks like a nice range of products- will see if they have it here in Austria. I haven't heard of this brand before, but anything natural you can count me in. That lipstick color looks so gorgeous! I loved the shades at least these shades are not looking dirty. Also, I was impressed by the way the lipstick has bee put on lips. I generally prefer for the lighter shades instead of dark shades.